We are back in the swing of it all. Let the bells jingle and the lights brightly twinkle, but don’t look up and tell me it’s going to snow! I don’t know if any of us is ever truly ready for that. However, I do think this wonderful time of the year is not only for the merriment of our children but also for us. Losing our cool over the latest gifts, and trying to figure out which family guests should sit next to whom, we have to remember our joys also. Tis the season to be mommy! Whether your style is red lips and a night out sip, or a cozy blanket for one on the best seat of the couch, it is yours. My season had the perfect kickoff with the Mom Trends Holiday Soiree in what I would like to call my perfect “time out”. With getting glammed up during the day followed by a view of the NYC skyline, via the Sugar Cane Raw Bar Grill in Dumbo, Brooklyn, lightening up like a holiday matinee, it was definitely the event of good company and cheer! First thing I think of when receiving an invitation is yay! I get to dress up. This quickly translates as I have nothing to wear. All while fighting the many styles in the closet to shut the door and make a dash. Well Mom Trends left no detail unattended Nicole and Sherri covered everything from fashion, beauty, home, gifting and food! Life is definitely too short to wear boring clothes, which is why we love Cabi Clothing. Each season they create a collection of the seasons hottest hues, and styles, and simplify life, with their stylists hosting parties for friends to gather and shop. Their styles are very comfy and this curvy mama lives in their denim. Yep, go check them out ladies. Indulging in a weekly blowout is seriously a must in my world of blonde tresses, and I am always willing to allow a new salon to give me a curl, especially with one of besties by my side. With locations throughout NYC, and thirty minute signature service, we were in and out of Glam and Glo, and looking fabulous with no time to waste to make a run to our next stop. Although you wouldn’t believe it today, (post crafting for a tv segment) but I do believe in amazing manicures. If you live, work or play like I do in New York City, GlossLab is perfect for you and your currently naked nails. $89 a month is the buy in, and the pay off, hold onto your seats ladies… UNLIMITED manicures, pedicures including shellac, gels etc! I don’t know about you but, I definitely feel a, “it’s me, not you” conversation coming on with my current manicurist. With my new shellac mani secure I felt confident to slip on my gorgeous Marcia Moran Chloe ring. Available in a variety of stones and plating. Friendship is all about sharing, and share I did as several of my friends indulged and tried on my new Chloe ring. The gorgeous new twist to the stackable ring trend- a multitude of bands held together by one rectangular stone centerpiece had everyone giddy in hopes to find it under their tree. As my friends and I always say love is definitely in the details. Creative details like Mabels Labels name tags make the holiday season a touch more personal adding the jingle to my bells. Also your gift suddenly becomes that gift that keeps giving, protecting valuables and ensuring they return home. Go ahead and add them to the EO Creative Works handcrafted eco-friendly festive pieces made to deck the walls and adding to the decor. With the Mom Trends Soiree in full swing at the Sugar Cane Raw Bar and Grill we were all ready to feast on sushi, duck and waffles and more! The beauty of the food, and table setting was not lost on this mom who is usually surrounded by character themed plates and plastic cups. The festive table with vibrant green glazed plates and hand blown glass sets were curated by Tighemi official. If you are looking for some Moroccan spice to inspire a beautiful home collection and fashion designs check them out. 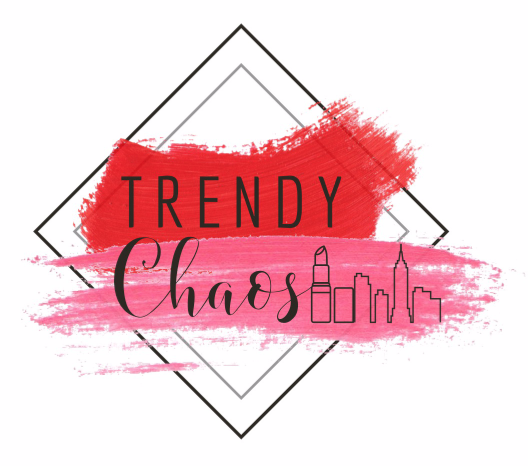 Disclosure: Thank you MomTrends for supporting our Trendy Chaos. All opinions are my own.